Here is a graph using the data that I made for this article on the 2008 Elections (ungated early version here). 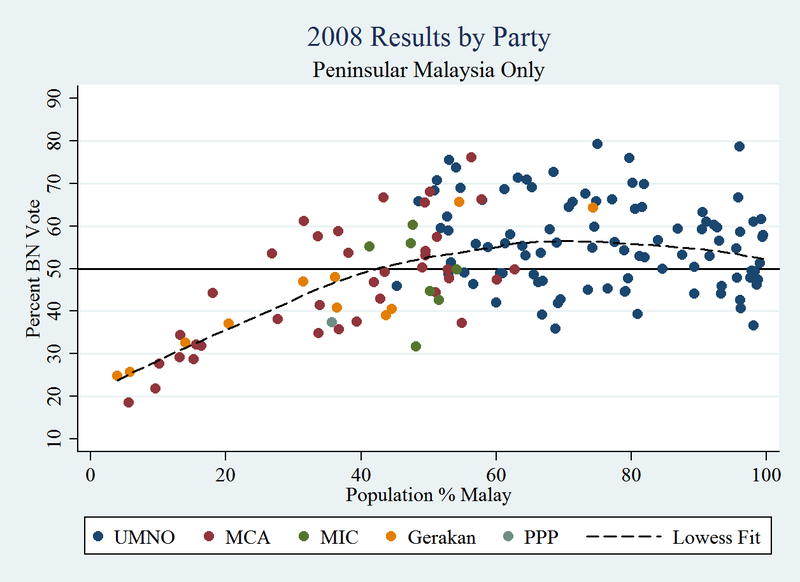 It shows the results of the parliamentary elections for each Peninsular electoral district, arrayed against the percent of that district classified as “Malay.” I’ve separated the results by BN party (UMNO, MCA, MIC, Gerakan, and PPP), and only included head-to-head races (only dropping a couple). Sometimes a graphic is worth 1000 words. Blue dots in the graph should be labeled UMNO rather than BN, yes?